BioTools develops dedicated instrumentation designed for spectroscopic studies of biomolecules. With a “dare to create” focus, they build products that help solve some of life’s most intriguing bio-problems, enabling molecular scientists to perform analysis and research that results in breakthrough findings. 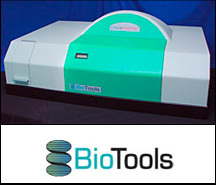 A case in point is BioTools’ ChiralRAMANTM Raman Optical Activity Spectrometer, the first commercial ROA Spectrometer. Used for determination of conformations of biological molecules such as proteins, nucleic acids, sugars and viruses, the ChiralRAMAN ROA Spectrometer lets users “see with 3-D vision.” In 2004, this product received a prestigious R&D 100 Award. Sponsored by R&D Magazine, R&D 100 Awards – often referred to as “the Oscars of Technology” – recognize the most technologically significant products introduced into the marketplace over the past year. BioTools prides itself on its scientific innovation. “Our focus is on the science of spectroscopy, that’s where our expertise lies,” says Dr. Rina Dukor, President and co-founder of BioTools. “But when it came to designing and building the actual product, we relied on the engineering expertise at Critical Link.” Critical Link provides turnkey product development and “surgical strike” development assistance to a broad range of scientific and technological equipment and instrumentation industries. Critical Link specializes in developing embedded systems, a key reason why BioTools turned to them. Critical Link centered its solution around the MityDSP, a high performance, highly customizable DSP platform that combines best-of-breed off-the-shelf components (CPU, memory, configurable FPGA) with a custom I/O board. For the ChiralRAMAN ROA Spectrometer, the MityDSP manages all image acquisition and processing, as well as all the device’s onboard optomechanical parts, such as shutters, optical rotators, and moveable optics.